Captive shaft electric cylinders are now available for Lexium MDrive® (LMD) integrated motor products. 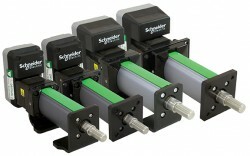 Quiet, clean and compact, these LMD products integrate motor, controls, and electric cylinder to deliver linear motion. And, unlike pneumatics, there is no need for compressed air, eliminating that expense, maintenance and noise. Announcing the release of a new Automation Library for improved control of industrial devices and motion control components over Profinet networks. The library add-on instructions (AOI) enhance the capabilities of Schneider Electric Motion’s Lexium MDrive® (LMD) Ethernet products by providing executable code blocks to speed interface with popular Siemens PLCs. A multi-turn absolute encoder feature is now available integrated with all-in-one motor and electronics Lexium MDrive® products. Without increasing product size, NEMA size 17 (42mm) & 23 (57mm) rotary and linear stepper motors with integrated electronics deliver multi-turn absolute encoder benefits in a compact size and at an extremely competitive price.